Trafalgar Sq is famous for the man perched high above it on the column, but I recently discovered another man hidden underneath the square who hardly anybody knows about and he is just as interesting to me. I have no doubt that if you were to climb up Nelson’s Column, the great Naval Commander standing on the top would have impressive stories to tell of Great Sea Battles and how he conquered the French, though – equally – if you descend into the crypt of St Martin in the Fields, the celebrated Road Sweeper who resides down there has his stories too. 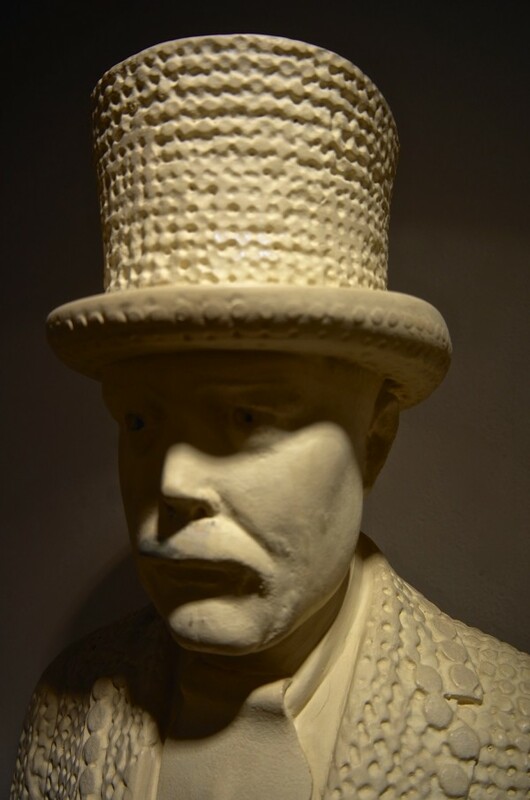 Yet as one who was born in a workhouse and died in a workhouse, Henry Croft’s tales would be of another timbre to those of Horatio Nelson and some might say that the altitude history has placed between the man on the pedestal and the man in the cellar reflects this difference. Unfortunately, it is not possible to climb up Nelson’s Column to explore his side of this notion but it is a simple matter for anyone to step down into the crypt and visit Henry, so I hope you will take the opportunity when you next pass through Trafalgar Sq. Henry Croft stands in the furthest, most obscure, corner far away from the busy cafeteria, the giftshop, the bookshop, the brass rubbing centre and the art gallery, and I expect he is grateful for the peace and quiet. Of diminutive stature at just five feet, he stands patiently with an implacable expression waiting for eternity, the way that you or I might wait for a bus. Yet in the grand scheme of things, he has not been waiting here long. Only since since 2002, when his life-size marble statue was removed to St Martin in the Fields from St Pancras Cemetery after being vandalised several times and whitewashed to conceal the damage. Born in Somers Town Workhouse in 1861 and raised there after the death of his father who was a musician, it seems Henry inherited his parent’s showmanship, decorating his suit with pearl buttons while working as a Road Sweeper from the age of fifteen. 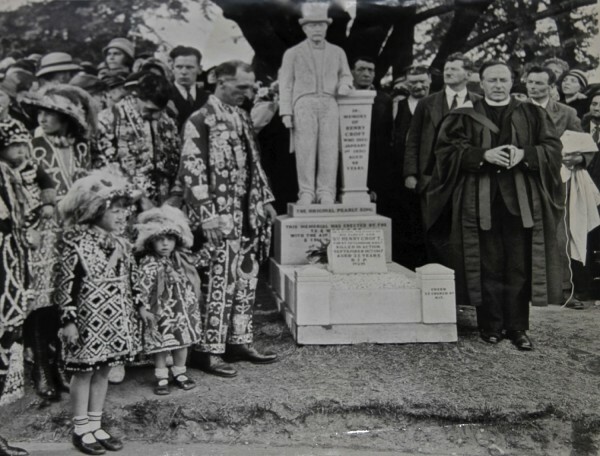 Father of twelve children and painfully aware of the insecurities of life, Henry launched his own personal system of social welfare by drawing attention with his ostentatious outfit and collecting money for charities including Public Hospitals and Temperance Societies. As self-appointed ‘Pearlie King of Somers Town,’ Henry sewed seven different pearly outfits for himself and many suits for others too, so that by 1911 there were twenty-eight Pearly King & Queens spread across all the Metropolitan Boroughs of London. It is claimed Henry was awarded in excess of two thousand medals for his charitable work and his funeral cortege in 1930 was over half a mile long with more than four hundred pearlies in attendance. 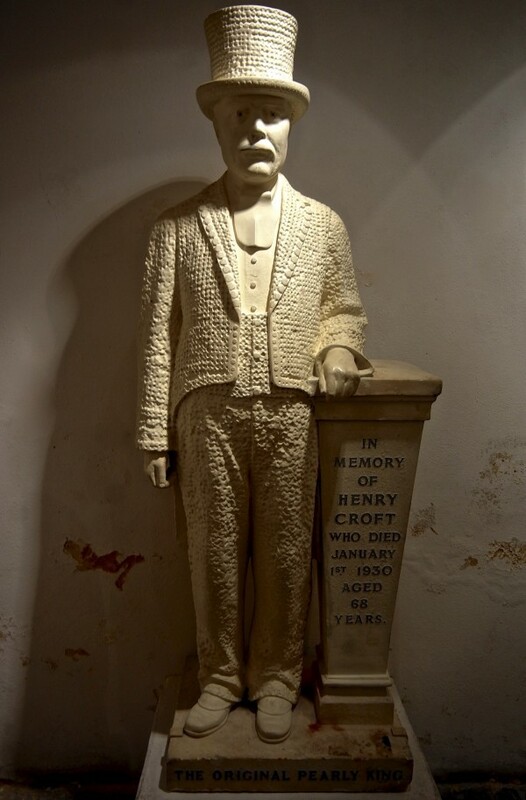 Henry Croft has passed into myth now, residing at the very heart of London in Trafalgar Sq beneath the streets that he once swept, all toshed up in his pearly best and awaiting your visit. I love the pearly persons as they are the probable originators of the style of NW coast Indian button blankets. And they are beautiful in their own right. I’d always wondered about the origins of the Pearlie Kings and Queens. I’ll seek out Henry Croft’s statue next time I’m close to Trafalgar Square. Really enjoyed this article! A beautiful story told beautifully. This is a lovely story and the photograph of the funeral is excellent. You’ve done this man a justice by casting light on him. That photograph is so telling of what the man meant to many. I’ll be sure to pay him a visit. As a Croft myself, I am so proud of this man for just wanting to give back to the less fortunate-and in Victorian times this amounted to many-and to be able to know his story. Many thanks from Melbourne Aust. There is an anuual “Pearlies” display & meeting at the Guildhall – last weekend in September – accompanied by bands & dancing – which is why I’ll be there, as one of the (Morris) dancers.